This time two years ago, we had a four-week-old baby, an obstreperous two-and-a-half-year-old, a newly renovated – but not entirely finished – cottage and a six-month-old brewery. There was no time, no money, and precious little peace. Actually, to be entirely precise, after morning naps on Thursdays, I grabbed a box of jam jars, a pair of girls and drove over to my mother’s house for lunch. In contrast to the chaos at home, the table would be laid, kettle boiling, floor swept – and an extra pair of hands ready to dandle a baby. Between all the dandling and afternoon sleeps and breastfeeding, there was time to transform the late summer bounty that I’d previously stashed in my mother’s freezer. We took peaches that my uncle had grown in his Kildorrery polytunnel to make Peach Vanilla Preserve and jars of Peach and Almond Jam. Blackcurrants from the freezer met just-picked crab apples for Apple and Blackcurrant Jelly. 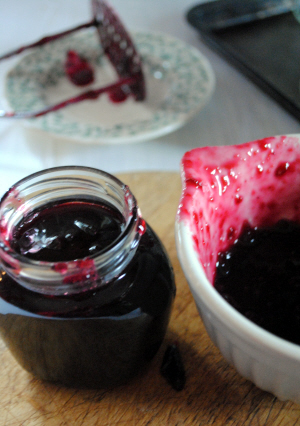 Damsons – from a tree discovered (and stripped) just two days before the Small Girl’s arrival – were simmered down to became this fabulously dark and rich Damson Amaretto Jam. Even on chaotic mornings afterwards, this jam preserved the flavour of my mother’s more peaceful kitchen, of extra hands making light work. Preserving sanity. My favourite jam-making books? Salt Sugar Smoke by Diana Henry* is the kind of cookbook you pick up when looking for a damson jam recipe and end up drooling over Hot Date and Preserved Lemon Chutney or Hot Smoked Duck Breasts. Brilliant for all kinds of year-round pickling and liqueurs and terrines. Darina Allen’s Ballymaloe Cookery Course has a sensible, no-nonsense chapter on jam and preserving, with straightforward master recipes and plenty of variations (worth it for the candied peel recipe alone). The Four Seasons Cookery Book by Margaret Costa manages to include marmalade, jam and chutney chapters in each season and has a useful ready-reckoner list of fruit : sugar : water ratios. This was one of the many Christmas presents made during our Thursday jamborees – and it is a great jam to give as a gift. I love the almond flavour of the Italian amaretto liqueur but, if you don’t have it, use gin, especially if you have some sloe or damson gin around. Of course you can just leave out the alcohol – but it might not be so calming at breakfast then. Put a saucer into the freezer. Put the damsons in a large, wide pan with the water and bring to a simmer over a medium heat until the fruit has burst. This takes about 30 minutes and I use a potato masher to help it on its way. Meanwhile, prepare the jam jars: wash jars in hot soapy water and rinse. Preheat the oven to 160°C and sterilise the jars by heating them for 10 minutes. Pour boiling water over the lids before using them to seal the jars. Tip in the sugar and lemon juice. Stir until the sugar has dissolved then bring to the boil. This is when you skim off the damson stones, again using the potato masher. Don’t worry about any scum – a knob of butter stirred in at the end will sort that out. After about 15 minutes boiling, test for a set by dripping a little jam on the cold saucer. Set aside for a minute then, if the jam wrinkles when pushed gently with your finger, it is ready. Makes approximately 5 x 454g/1lb jars. * I received a review copy of Salt Sugar Smoke by Diana Henry from publishers Mitchell Beazley.